Containers, also called Container spells and Contained spells, are essentially little worlds, in which specific events are made to happen which in turn affect the client or situation targeted. Hoodoo rootworkers cast magic spells inside containers by creating mojo bags, conjure hands, bottle spells, and jar spells for their clients. Southern-style hoodoo container spells can be crafted to provide spiritual assistance in almost every type of situation. Professional rootworkers who prepare container spells for clients find them valuable and practical in the performance of a wide variety of love spells, money spells, blessing spells, protection spells, career success spells, health and healing spells, spells for the removal or reversal of crossed conditions, curses, or jinxes, court case and mediation spells, spells to increase psychic gifts, or spells to drive away or get revenge on an enemy. Within the container, no matter what material it is made of, the root doctor or hoodoo worker places items selected for their symbolic links to desired outcomes, such as love roots or money-drawing minerals or cursing herbs. 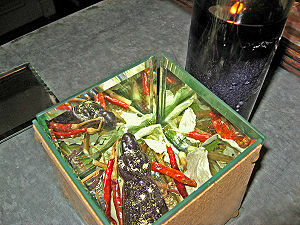 As each item is added to the container it may be prayed over, blessed, or cursed, as is appropriate to the situation. The container is then personalized for the client, if possible by the addition of personal concerns or at least a name-paper. 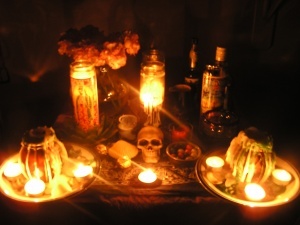 It is then fixed and dressed with spiritual supplies such as conjure oils or sachet powders, and again prayed over or cursed, as deemed appropriate to the client's situation. Once the container is sealed, it may be left on the altar to work for a period of time, or it may be buried in one's front or back yard, put into a freezer, thrown into running water or into a crossroads, or buried in a cemetery, depending on the type of work being done and the client's intentions. Bottle Spells are spells that a hoodoo rootworker worked within a glass bottle or jar. One well known form of bottle spell is the old English "witch bottle." Dating back to the 1600s, these are bottles filled with nails, hair, and urine that were buried beneath doorsteps or placed up the chimney to keep away witches. Similar witch bottles are still made and used in contemporary hoodoo practice. As prepared by spiritual root doctors, bottle spells may contain a variety of curios such as herbs, minerals, petition papers, scriptural prayers, excerpts from The Book of Psalms, and personal concerns. 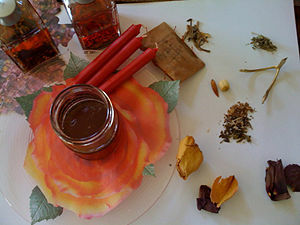 Depending on what they contain and how they are prepared, they can be used to cast magical spells for a wide variety of purposes, including love drawing, money drawing, court case and legal work, blessing, Hot Footing bad neighbors or co-workers, protection, binding enemies, breaking up couples, and ensuring peaceful home situations. The type of bottle that your rootworker chooses is both a matter of personal inclination and tradition. It may be a new bottle that has never before been used, or it may be a used culinary bottle containing foodstuffs. It may seem odd to those unfamiliar with the tradition, but it is common for bottle spells made that are intended for Hot Footing and break-up work to be crafted within used hot sauce bottles, and for bottle spells intended to sour relationships between people to be worked inside used vinegar bottles. Conjure doctors who have artistic talents may create hand-decorated bottles for their clients, using paint, decoupage, gilding, and fabric applique, or glitter. This is especially true when the spell-casting that the conjure doctor is performing is of a positive or protective nature. When consecrating bottle spells, some workers speak a prayer, recite a specific Psalm, or say a curse over each individual curio that they insert into the bottle, as they deem appropriate to the client's needs. They may then burn a small candle in the bottle's mouth prior to the work being sealed and again prayed over or cursed, as needed. The finished bottle may be sent to the client for use on a home altar or for burial or placement in a freezer, or disposal at a crossroads, in a cemetery, or in a river, as instructed, or it may be retained by the rootworker on his or her working altar for continued and ongoing spiritual spell-casting and candle-work. To keep a bottle spell on the altar "awake" and working, your conjure doctor may shake the bottle rhythmically once a day as a cadenced prayer or invocation is sung or spoken aloud. In addition to the above uses for bottle spells, practitioners who work within the Islamic tradition may prepare bottle spells as containers for the entrapment or containment of the powerful spiritual entities known as djinn or genies. Jars are similar to bottles, but the necks are wider, allowing for the insertion of larger items. Mason jars, canning jars, and jam jars are the types most often seen in practical use, but any type of jar will do. 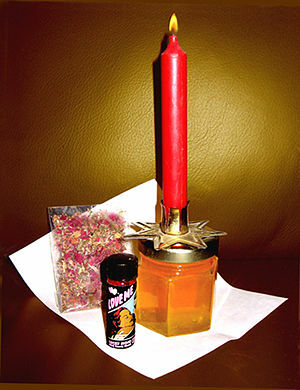 The best known jar spells are sugar and honey jars, which hoodoo rootworkers employ when they want to sweeten people and situations on behalf of a client, and vinegar jars, which conjure doctors may prepare to sour a client's enemies or foes, thereby causing them to fuss and fight with one another. Instead of burning a candle in the mouth of the jar, as one might do with a bottle spell, the root doctor typically burns candles on the lid after the jar is fixed, sealed, and prayed over. 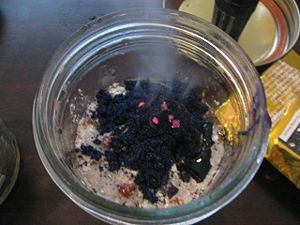 Some hoodoo rootworkers keep prepared jar spells on their altars for their clients, charging a fee for continued weekly prayers, recitation of Psalms, and candle burning. 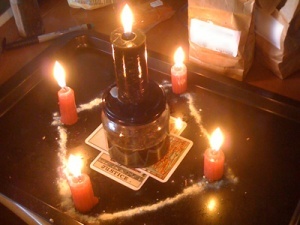 Some conjure workers prepare jar spells for their clients with instructions for use and a supply of candles, and the clients then work the jars in their own homes, which may include keeping them on an altar, placing them in a freezer, or disposing of them at a crossroads, a cemetery, or in a river. When people do not have a yard in which to bury spell items, and when a candle cannot be burned on a jar, due to the need to keep one's work private, it is quite common for the root doctor to prepare a potted plant spell. To do this, the worker places the spell items in the bottom of a flower pot, fills the pot with soil, and plant san herb, flower, or fern in the pot. The potted plant is thus a container spell. Potted plants are easy to use for every kind of work, under the proper circumstances. The species of plant your rootworker selects for the container, and the instructions that will be given to you about the container's placement are important aspects of the work. To make a love spell, for instance, sugar or honey and personal concerns can be placed inside a hollowed-out red apple or red onion, the loaded and prepared apple or onion situated at the bottom of the plant pot, and a love-drawing herb or flower can be planted on top. If there is gossiping on your job between co-workers and managers and you feel that you are getting frozen out of the social arena and that the gossiping may have a negative impact on your chances for career advancement, then you can ask your hoodoo rootworker to prepare a protective, sweetening, gossip-stopping, boss-fixing, and crown-of-success type empowered, fixed, and prepared talisman or enchanted jewelry to wear or a mojo hand to carry on the job, but you can also significantly increase the impact of such work if also back it up with a secretly fixed office-friendly container spell of some kind that will continue to work its magic even when you are not in the room. A potted plant spell is a common and extremely effective holder for this kind of work, as is a fixed and prepared family photo in a frame. 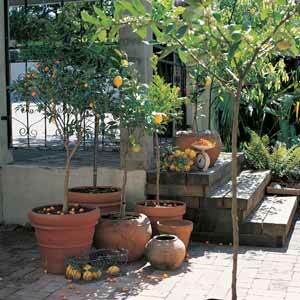 Citrus plants are associated with spiritual cleansing, road opening spells, and cutting away of warding off negative influences, so a prepared spell in the base of a potted citrus plant that is situated by the entrance to a home will act as a powerful guardian and will spiritually purify those who enter. Contrariwise, cayenne pepper is used to hot foot and send unwanted people away, so a potted plant spell prepared for protection and hot footing of a bad neighbor might take the form of a cute ornamental chili pepper plant in a pot, with the spellwork contained out of sight. Such a plant could also be used in an office setting, to ward off disliked co-workers. 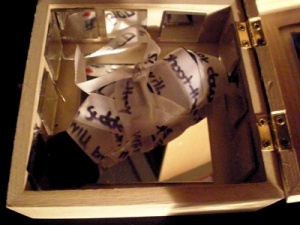 The most famous box spells are mirror-boxes, which are used to confine an evil-doer and reflect and reverse all curses back to the sender, and coffin spells, which are used to curse an enemy to the grave. Both mirror box spells and coffin spells may be buried in a cemetery after they are prepared, with petitions for the work to be held under the ground by spirits of the dead. These works are usually prepared for clients by an experienced root doctor, working by the light of a black candle. Sweetening or souring spells may be worked with boxes as well. For instance, a rootworker may use a box of sugar instead of a honey jar as a container for a sweetening spell. Doll-babies, dollies, voodoo dolls, and poppets are names given to figural images intended to represent human beings upon whom a spell is to be cast or for whom spiritual work is to be performed. Well-made doll-babies are stuffed with an array of personal concerns, herbs, roots, minerals, and talismanic items, which means that they are, in essence, a specialized form of container spell. A mojo bag -- also called a conjure hand, gree-gree bag, toby, nation sack, trick bag, wanga, or roots bag, is a small contained spell traditionally prepared by a spiritual worker for a client and covered with red flannel or chamois leather. Typically, the mojo bag is worn on the body or placed inside the home or car where it cannot be seen. This page was last modified on 23 April 2019, at 21:26. This page has been accessed 101,446 times.